Why is it so hard to be the parent you thought you would be? Do your kids sometimes make you feel your head is going to explode? Ever yelled at them until you were hoarse? Do you have days when you feel like making a run for the airport? 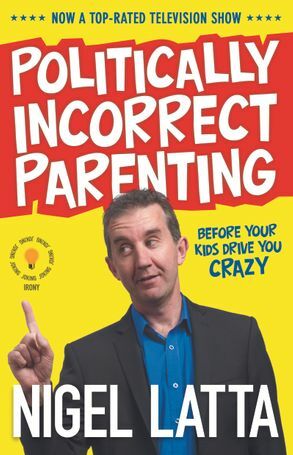 For harassed parents struggling to understand why they end up screaming at their kids and tearing their hair out trying to make them understand that bad behaviour has inevitable consequences, this is the perfect book to help your family make it through the crucial first decade or so and still enjoy each other's company. Practical commonsense answers and real life examples, logical and realistic strategies, and innovative behaviour modification tools that work in the real world - all from a parent and family therapist who's seen almost everything there is to see and offers some hard-won battlefield wisdom. Written in down-to-earth language, this book needs to be handed out at birth, an essential guide for the struggling parent who knows family life can and should be better. Clinical psychologist, bestselling author, and father of two, Nigel Latta specializes in working with children with behavioural problems, from simple to severe. A regular media commentator and presenter, he has had three television series adapted from his books - BEYOND tHE DARKLANDS, tHE POLItICALLY INCORRECt PARENtING SHOW and tHE POLItICALLY INCORRECt GUIDE tO tEENAGERS (all of which screen in New Zealand and Australia) - and has had a regular parenting segment on National Radio. Respected clinical psychologist, bestselling author, and father of two boys of his own, Nigel Latta specializes in working with children with behavioural problems, from simple to severe. A regular media commentator, he has presented two television series adapted from his books - Beyond the Darklands (which screens in both New Zealand and Australia) and The Politically Incorrect Parenting Show - and has a regular parenting segment on National Radio’s Nine To Noon.